Egyptian telecommunications market is the most developed in North Africa. Nevertheless, the post-Arab Spring revolution crisis in the country had a negative effect on the state of telecommunications infrastructure. At the same time, the Egyptian government has done a lot recently to improve the situation, also by attracting foreign investors. How did it affect the tariffs for Internet services? How much does it cost to connect the Internet for international traffic termination in Egypt? 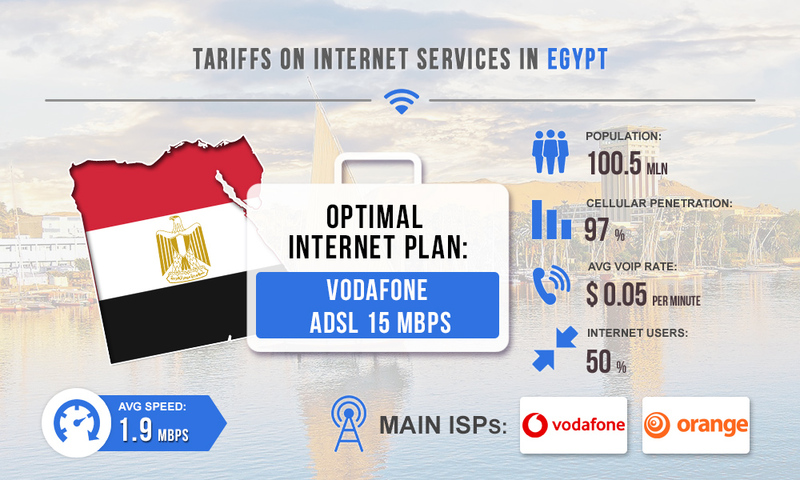 Egypt is connected to several international underwater fiber optic cables and there is an extensive national trunk in the country's territory, so there is an access to the Internet via FttP technology. ADSL Internet can also be connected. Popular Internet providers in Egypt are Vodafone, Egypt Telecom, Orange. 5 Mbps. Several Internet plans are available: limit 100 GB — $6.5; limit 200 GB — $12. 15 Mbps. Several Internet plans are available: limit 75 GB — $6.5; limit 100 GB — $8.6; limit 200 GB — $14.5; limit 300 GB — $20; limit 500 GB — $22. The stated price of Internet packages is for 1 month. If you connect ADSL Internet from Vodafon, you'll get a bonus - free router. The most suitable option for voice termination is ADSL 15 Mbps package with a data limit of up to 300 GB. The speed of 15 Mbps is optimal for voip switch hardware and the cost of $20 per month is quite affordable, with earnings in Egypt starting from $ 150 a channel. If necessary, you can buy additional gigabytes to increase the limit.